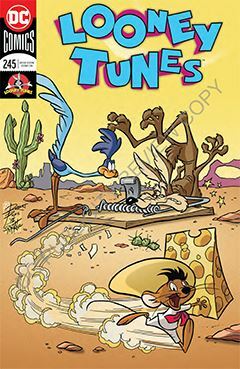 Tag "Looney Tunes, Sylvester, Daffy"
This issue of Looney Tunes presents an idea of “Why didn’t anyone think of this before?” Specifically, teaming the Road Runner with Speedy Gonzales. The Fastest Mouse in All Me’ico comes to the rescue when Road Runner’s injured foot prevents him running down the road all day. This is followed by a two-page episode as Foghorn Leghorn attempts to keep Daffy Duck from jinxing the performance of “The Scottish Play.” Imagine – Foghorn trying to keep someone else quiet. Not an entirely convincing effort on the part of Looney Tunes’ biggest loudmouth. Finally, we are presented with Shaolin Puddy Tat, as a sensei seeks to inspire his student with the wiley ways of the cat. However, like Foghorn before him, Sylvester is not the best example which to follow. It was a little strange to see humans portrayed opposite Looney Tune characters. Usually, for Elmer Fudd or Yosemite Sam, they have a certain style, but the two humans here seem worefully out of place in the story; it read like a crossover between the Loonies and Hanna-Barbera. Sylvester returns in a brief follow-up, as he disguises himself as a feline falcon, only to find himself a woefully endangered species. This time, the humans resemble Simpsons-style animation, which is an even less palatable mixture. For long-time fans of Looney Tunes, this particular issue is fairly weak. Oh, well, you can’t win them all.